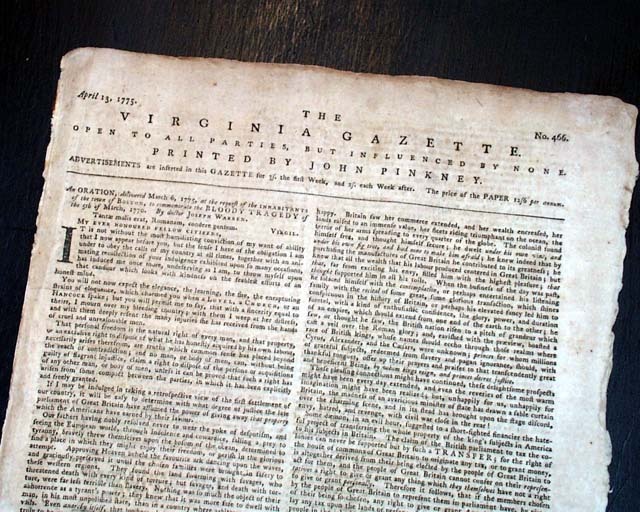 THE VIRGINIA GAZETTE, Williamsburg, April 13, 1775 This is by John Pinkney, a distinction to be made since there were three newspapers of this title printed in Williamsburg during the early period of the Revolutionary War. 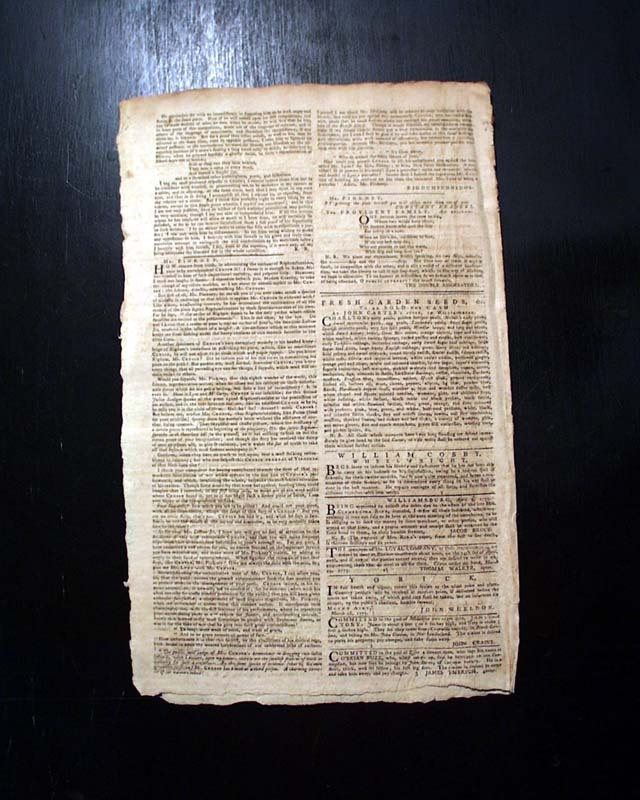 Purdie and Dixon published a paper of this title, and then a third title which began in early 1775 was begun by Alexander Purdie after leaving the paper mentioned above. This is just the 2nd issue by Pinkney since it took over full proprietorship after his partnership with Clementina Rind. A very rare opportunity for a scarce title from Virginia, as any seasoned collector is aware. 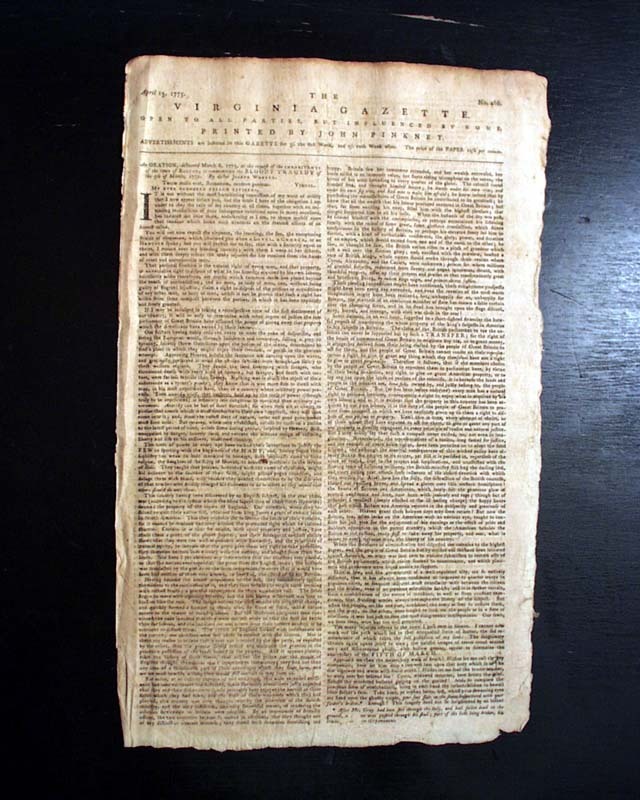 The entire front page and most of page 2 are taken up with: "An Oration, Delivered March 6, 1775, at the request of the Inhabitants of the Town of Boston, to Commemorate the BLOODY TRAGEDY of the 5th of March, 1770. 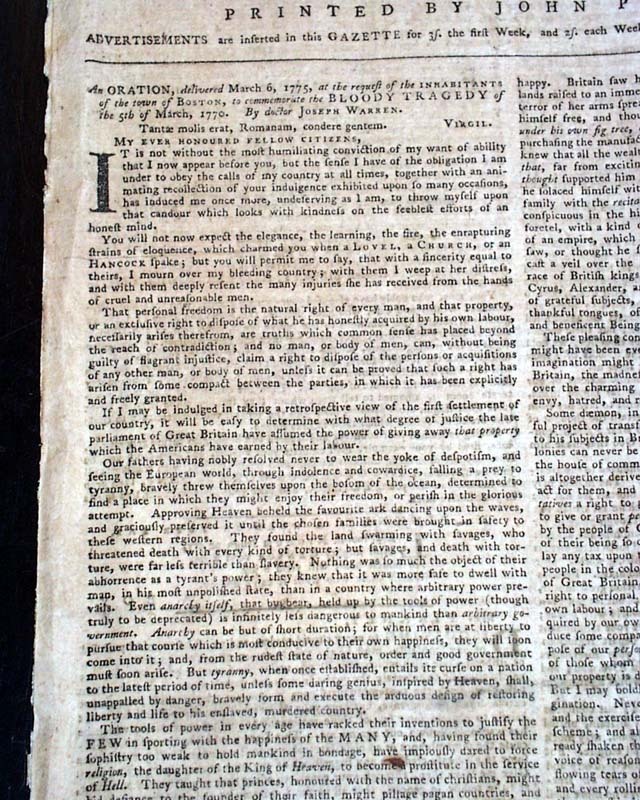 By Doctor Joseph Warren." We know this as the Boston Massacre. 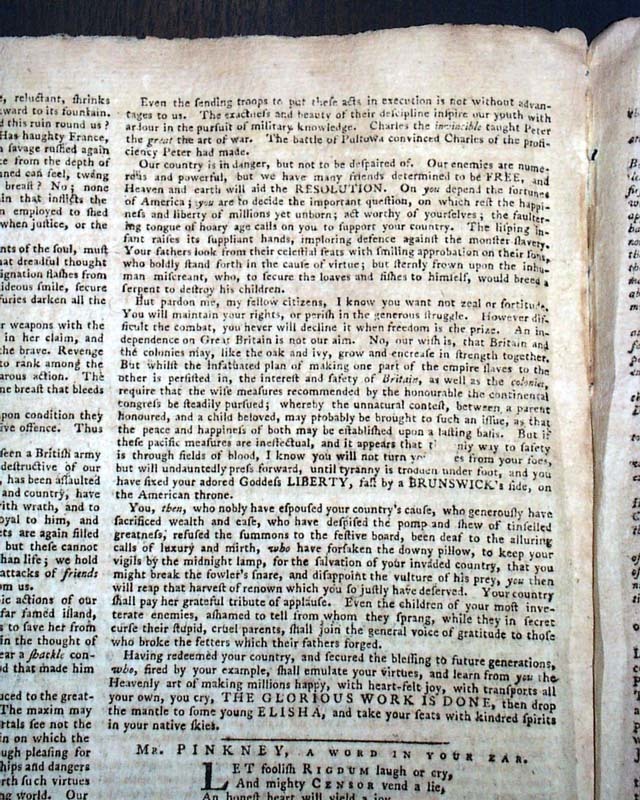 This was a very famous oration, the full text of which is available on multiple websites. 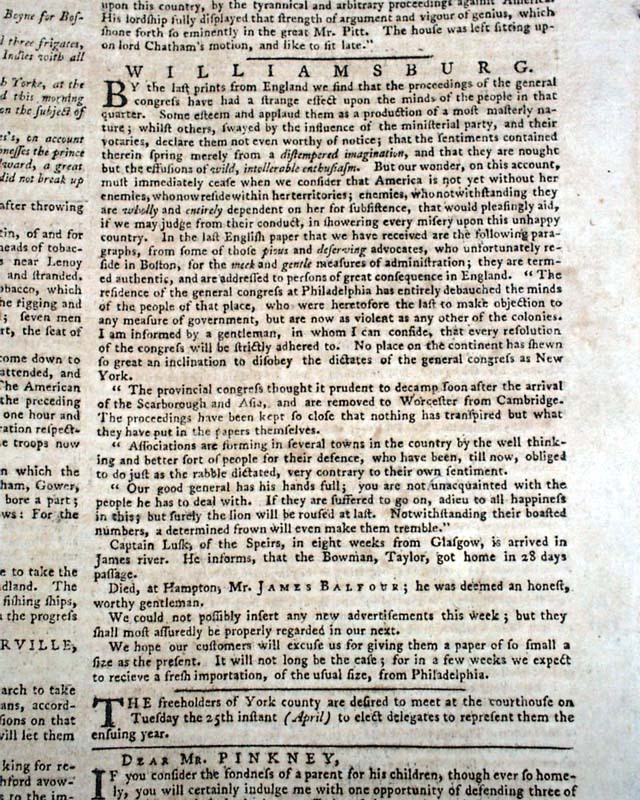 Page 3 has some nice items under the "Williamsburg" dateline, bits including: "...we consider that America is not yet without her enemies, who now reside within her territories; enemies, who notwithstanding they are wholly & entirely dependent on her for subsistence...The residence of the general congress at Philadelphia has entirely debauched the minds of the people of that place...are now as violent as any other of the colonies...I can confide that every resolution of the congress will be strictly adhered to...Associations are forming in several towns in the country by the well thinking & better sort of people for their defence..." and more. 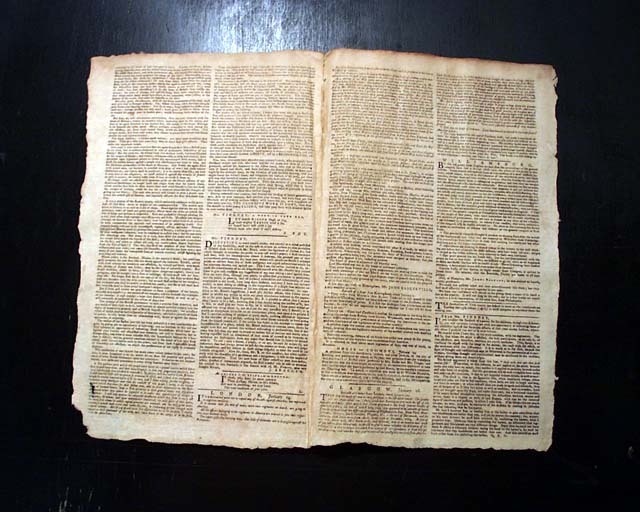 Complete in four pages, very nice, untrimmed margins, and although there is a very small print-pulp imperfection (not uncommon) which causes the loss of a few letters of text, the issue is in terrific condition.